CHICAGO – Not all HBO shows are created equal. While critics have devoted thousands of words to the brilliance of shows like “Boardwalk Empire,” “Curb Your Enthusiasm,” and “Game of Thrones,” a few other offerings from the most important TV network of the last quarter-century have gone under the radar. Should they have? Should you dig down and find “How to Make It in America”” and “Hung,” starting their second and third seasons, respectively, on Sunday, October 2nd, 2011? Well, not really. “Hung” is the superior of the two offerings but this appropriate pairing suffers in both halves for similar reasons — neither show feels genuine; both are proof that television is still a writer’s medium and if the writing isn’t there, it just doesn’t work. The strong ensemble of “Hung” can sometimes elevate the material and, on a similar note, the young cast of “How to Make It in America” is getting better with more experience, but both shows feel frustratingly scripted. The characters too often don’t resonate in believable ways. Both shows are about people trying to make it in an unpredictable economy, but both falter by not being as relatable as they need to in order to be truly memorable. The similarities between “How to Make It in America” and “Hung” didn’t register until I had to review both in light of Sunday’s premiere. Each comedy is essentially a reflection of current times in that both feature people facing the economic crisis in unique ways. On “Hung,” a man who loses everything realizes that his sexual ability is the only thing that really can’t be taken away from him and so turns to male prostitution to, no pun intended, make ends meet. On “How to Make It in America,” a pair of young entrepreneurs deal with the always-changing business scene in NYC as they try to make their mark. The inferior of the two shows feels not only like a product of the ’10s economy but practically like a Big Apple version of “Entourage.” Whereas that HBO hit was about a group of clever, young guys trying to make it in the entertainment scene while not losing sight of their friendship, this one is about a group of clever young guys trying to make it in the fashion scene while not losing sight of their friendship. Ben (Bryan Greenberg) and Cam (Victor Rasuk) are not that dissimilar from Vince and Eric a few years before they made it big. It even has a similar style with an emphasis on fashion, parties, romantic complications, and fast-talking. At the end of last season (recently released on Blu-ray, which we’ll get to later), Ben and Cam had gotten pretty close to their dreams and the question for season two appears to be not only how to continue on that upward trajectory but how to not lose sight of what’s important at the same time. The opening scenes of the season premiere of this eight-episode second season features Ben and Cam on a trip to Japan to take their fashion brand international and pick up a few tips from overseas. Once again, each episode seems to center on the guys trying to hustle and talk their way up the next rung on the ladder whether it be chatting up the right people at a party or talking their way into a front-window display at a happening store. Like “Entourage,” there are recurring characters circling the central pair, including Ben’s ex-girlfriend Rachel (Lake Bell), Cam’s cousin Rene (Luis Guzman), their hedge fund manager benefactor David (Eddie Kaye Thomas), Ben’s new girlfriend Julie (Margarita Levieva), Cam’s new girlfriend Lulu (Nicole Laliberte), and their hip friend Domingo (Kid Cudi). One of the major problems with “How to Make It in America” is how little these characters register beyond their brief descriptions above. Guzman is always fun and Levieva is an interesting young actress, but Bell, Thomas, and most of the rest of the supporting cast simply isn’t memorable. It’s in no small part because they’re given nothing interesting to say or do by screenwriting that’s just flat. I like Ben and Cam. I want to root for them. But I need the show to give me a reason to care that’s just not yet there. The first season of “How to Make It in America” was recently released in a two-disc Blu-ray set with typically-strong HBO transfers and special features. There are commentaries on all eight episodes, deleted scenes, and featurettes. It’s a remarkable collection of bonus material for a show that I wish was more remarkable itself. The series about the male prostitute in the Motor City has been, at times, remarkable, but the third season starts on a mediocre note. I thought that the second season of the show might finally push it to its full potential but the third season opens with all of the characters in places that feel overly familiar. For a show to be this repetitive in only its third season is simply unacceptable and I have to assume that it may not get a fourth if this continues. Where will “Hung” go from here? The cast is strong enough that I still hope it’s someplace interesting but I’m starting to get tired of waiting for it to get there. 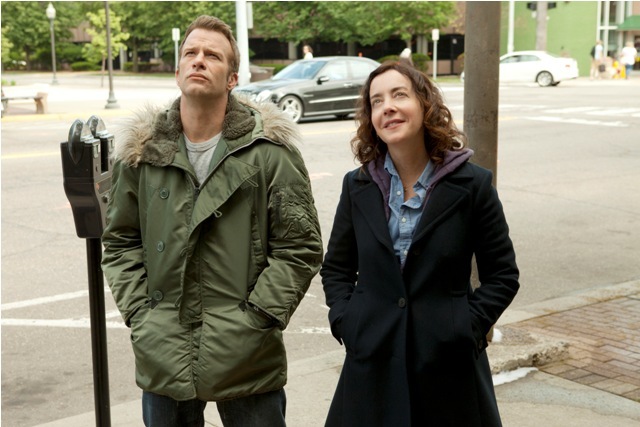 “Thanks to a lot of f**king, I could finally fix up my house.” The third season of HBO’s comedy features Ray (Thomas Jane) and Jane (Jane Adams) trying to take their business to the next level after pretty much exhausting their opportunities (and most of the women) in suburban Detroit. The new season features a potential rival to Ray while Jane seeks a bank loan to kick-start a new client-generating venture. The second season of “Hung” was recently released in a two-disc Blu-ray set and, like “How to Make It in America,” it’s well-transferred and accompanied by strong bonus material like commentaries and deleted scenes. For years, HBO seemed to let shows speak for themselves with little in the way of special features. Perhaps they know that these shows might need a little more help than their best programming when it comes to standing on their own. ‘Hung,’ which airs on HBO, stars Thomas Jane, Jane Adams, Anne Heche, and Rebecca Creskoff. The show returns on Sunday, October 2nd, 2011 at 9pm CST. ‘How to Make It in America,’ which airs on HBO, stars Bryan Greenberg, Victor Rasuk, Eddie Kaye Thomas, Margarita Levieva, Kid Cudi, Lake Bell, and Luis Guzman. The show returns on Sunday, October 2nd, 2011 at 9:30pm CST. “How to Make It in America: The Complete First Season” and “Hung: The Complete Second Season” were both released by HBO Home Video on Blu-ray and DVD on September 27th, 2011.